Hallelujah! The year is almost over. It's almost time to evaluate my successes and failures. But not in this show. 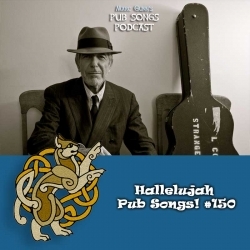 This is Marc Gunn Radio with a highlight on a recording I made several years ago of "Hallelujah" by Leonard Cohen. I'm trying to decide if I want to re-record it or use this version for a future album. I'd love your feedback at pubsong.net. You can support my music. Buy a CD in my Celtic Music CD Store. The Pub Songs Podcast was produced by Marc Gunn. If you enjoyed this episode, please support the musicians who support this podcast, buy their CDs, then share the show. Special thanks to all of my Gunn Runners on Patreon. They pledge $1 or more per month to support my music. As a patron, you'll get free music downloads, early versions of songs and lyrics, behind-the-scenes podcasts, and first look at new videos. Find details on Patreon at marcgunn.net. Finally, how would you like 5 of my most-popular MP3s? Plus weekly updates of what's new. Sign up at pubsong.net.